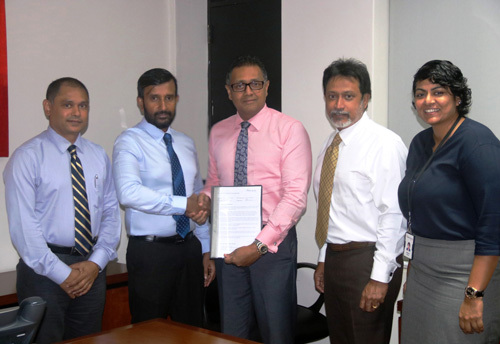 Tuesday 24th April 2018, Colombo: Leading the banking industry in pioneering FinTech solutions, DFCC Bank has launched DFCC iConnect; a fully integrated Payments and Cash Management (PCM) System, with the objective of delivering a superior service experience to businesses of any size, whether it be an enterprise business, mid-sized business or small business. This innovative solution was developed by AurionPro, a global technology solutions leader specialising in digital innovation. This solution empowers DFCC Bank’s business clients with access to their account transaction information from any location; be it local or global. It also provides enhanced security features that enable real-time viewing of account balances, making local / cross border payments and choosing the best solution for collection possible at the click of a button. Furthermore, this system can be fully integrated to the customers’ ERP (Enterprise Resource Planner) through a fully-fledged secured direct Host-to-Host (H2H) channel where encrypted payment instructions can be pulled automatically on to the DFCC iConnect platform, thereby helping the customer to achieve increased productivity as there is no duplication of manual work when processing payments in the day-to-day operational routine. What is unique about DFCCiConnect is that it includes a fully-integrated Financial Supply Chain Management (FSCM) System, Virtual Accounts (VA) and a state-of-the-art mobile application with biometric (Fingerprint recognition) capabilities for payment authorisation. The FSCM solution provides clients with a supply chain finance platform where their dealers and suppliers receive an end-to-end financing solution along with a Straight Through Processing (STP) mechanism for invoice settlement; the key benefits being that it enables channel financing while shortening time to market. Furthermore, customers can identify their payers automatically without issuing a reference code through Virtual Accounts, thereby they have full visibility of their day-to-day transactions. Its fully automated process flow also adds to customer convenience. This highly secured online portal will enable users to experience a comfortable Graphical User Interface (GUI) and a state-of-the-art web solution for financial activities. The platform also allows users to perform ad hoc/ single payments and bulk payments at the click of a button as well as receive personalized prompt alerts via email and SMS. Moreover, it caters to any kind of authorization matrices according to the business requirement of a company, routes all local and foreign payments (Company cheques /cashier’s orders/ bank transfers via SLIPS, CEFT and RTGS / Telegraphic Transfers) and maintains an audit trail of all activities that are performed on the system for future reference purposes.